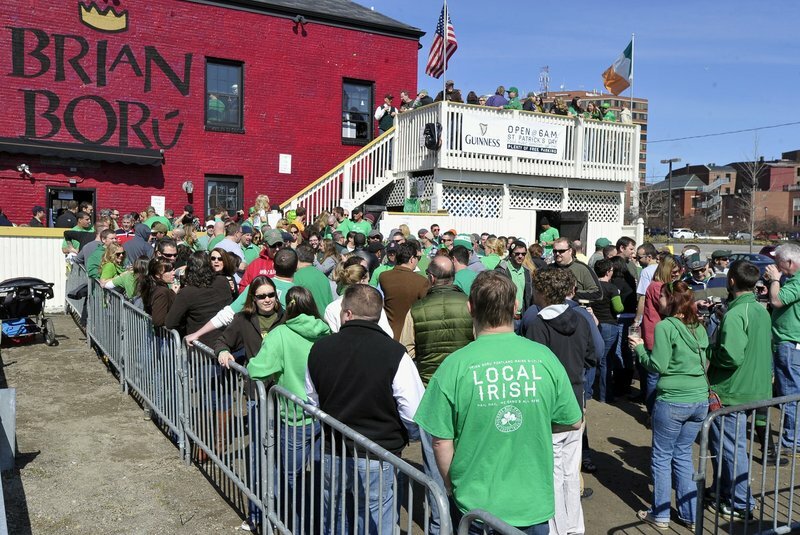 The characterization of St. Patrick’s Day and those who celebrate it in your March 19 front-page story (“Revelers had saintly day”) was based on tired stereotypes which would not be acceptable if applied to another ethnic group. Against the backdrop of Portland’s rich Irish history, the downtown parade, the early-morning swim for charity, the tradition of families eating, dining and celebrating their culture and history together, it’s unfathomable that your editors would allow such a narrow, superficial piece to run. In Ireland, St. Patrick’s Day was traditionally celebrated as a religious holiday, with Mass and a family meal. Pubs were closed. In 1995, this changed to include parades and cultural festivals to boost tourism. Portland should take note. St. Patrick’s festivals could embrace all of Maine’s rich immigrant experience. There are more government workers in this country than there are workers in manufacturing. Most government workers get 100 percent of their health insurance paid for. If government workers had to pay at least 20 percent of their own health care, it would pay for the whole food stamp program for those who do not have enough to eat in this country. One-fifth of the Oxford County budget goes to pay for health insurance. Most of us pay for a great deal of our own health care, after paying taxes on our earnings. Government workers’ health insurance is not declared as income, and no taxes are paid on their free gift. Free, 100 percent health insurance is the biggest welfare check I know of. I really appreciated William J. Leffler’s March 18 critique of George Will’s column (“Critique of federal education role ignores society’s mobility”). My thought is that he didn’t go far enough. The problem with state- or city-determined education is that there are so many factors to consider when designing a curriculum. Certainly the overall philosophy of a community is a determining factor. But the factor that looms largest, in my opinion, is the wealth of a community. When property taxes are used to partially fund public education, the complexity of offerings varies according to what the community can pay. Wealthy communities have public schools that compete favorably with the best private schools. Less-fortunate communities must limit their offerings to what they can afford. As a family that moved several times, we prioritized education, choosing schools over real estate. The result for our children was good education, even though our homes weren’t particularly impressive. We felt lucky to have been able to find a way to provide solid educational experiences for our kids. In the United States, states’ rights take precedence over what is considered government interference. It will be hard, if not impossible, to overcome the desire for independence from government control. But the “No Child Left Behind” law was exactly that. It is possible to create a well-thought-out curriculum without adding punishments, i.e., government interference and oversight of standards. Trust schools to do what they do best. Teach. And there is nothing to prevent the addition of courses that reflect community interest. Until all children get an equal chance at receiving a good education and the opportunity to go on to higher education, we are legislating a sub-class. There is a solution to the problem of illegal Mexical immigration: a political merger of the United States and Mexico for mutual benefit. This is not an invasion of Mexico by the United States. On the contrary, it is recognition of the de facto “invasion” that has occurred over time. We are a multilingual nation. Countless numbers of “illegal” Mexicans are woven into the fabric of the American populace. This egg cannot be unscrambled. Not a problem, but instead a golden opportunity for a friendly merger with Mexico. • Adds vast human, land and mineral resources. Difficult to accomplish? Yes. So was the Louisiana Purchase in 1803/1804. The obstacles then were huge. So was Thomas Jefferson. His vision and skill created what would become the great fertile American heartland, breadbasket to the world. Was this a mistake? I think not. Great leaders do great deeds. Can we find another Jefferson? The need is compelling.